Sometimes, the difference between winning and losing is a split-second. Saturday morning softball. The batter hits the ball hard to the shortstop, she scoops the ball into her glove, and fires to the first baseman. Out. Yet, it’s not that simple. There are some many opportunities for a bobble, a misstep, an error, a mistake. All split-seconds. This is my response to Word Press’s Weekly Photo Challenge: Split-Second Story. It was a good challenge. I got a new camera and giving it a whirl. The old one died and I needed something more than the iPhone camera. 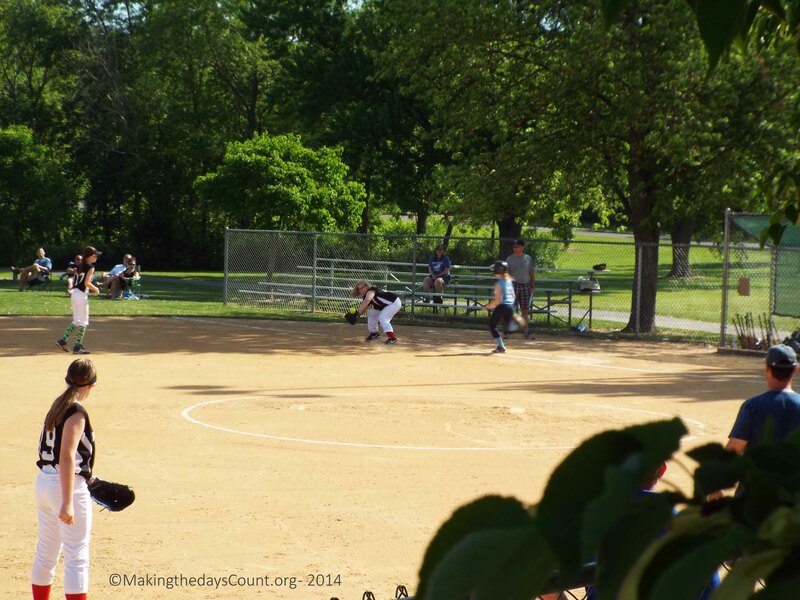 I shot the photo Saturday morning at O’s softball game with this post in mind. I sorted through a handful until this gem popped up, rather grounded out. That’s O and first base. It looks like the girl is out, but I don’t remember the play, exactly. There were a lot of split-seconds in the game and some didn’t go our way. A misstep, an error, a bobble. O’s team ended up on the short side of the score, but you don’t have to win them all, just the last five – in the playoffs. There are three games left on the regular season schedule, playoffs begin in a couple of weeks and we’ll learn the value of a few split-seconds. We’ll also see the value of perseverance and commitment – playing and trying hard until the end. A few more activities left, a couple of assignments, and we are done. Split-seconds. Today is gonna be a great day, I know it and I can feel it. Making the Days Count, one day at a time, one moment, even the split-seconds. Can you remember a split-second, a specific one? What happened? I remember my little league days. I played second base and loved every second of it. I hated those wrong split second decisions, that’s for sure. We took second place overall in our division, though, so overall, not too bad. Thanks for the fun reminders. you are welcome… summer is a special time of the year. Every season has it’s positives and negatives and we glean the good and purge the bad, or at least we should. Right now O’s team is dead last with two games to go in the regular season. The playoffs begin next week and the team will be the last seed… all we need to do is win out! Have a great day. Nothing says summer like softball on a sunny day. Nice one, Clay! I agree! O’s team played last night, beautiful evening game… she came up short 7-8…. best game of the year! Two more, then playoffs.. I am headed to the lake this weekend, I can hardly contain myself.